Forgive me if my spelling goes awry in this communication as I am literally shaking with rage at the unforgivable actions of your company. Firstly I wish to make it plainly clear I am furious at the actions of the company and not the poor individual who has to read and respond to this letter. I bear you no ill will good sir or madam, it is not your fault I am in such a rage. Please don’t take the tone of this letter personally, you have to work and replying to such communiqué is your job, I know in these recessionary times we all have to do what we can to make end meat. I hope your day is going well, personally my day was going very nicely, that was until I saw what I saw, which I suppose you would be interested in knowing as this is the whole reason I am writing to you. Picture the scene in your idea purse (brain) I was happily doing my usual Monday morning shop at my local Tesco, getting the essentials sundries such as anchovies, cooking chocolate, vegan beef, staples (I don’t own a stapler but I like the way staples look), dragon fruit, dog egg bags, wheat free wheat and of course Smaptons. As I say, just the essentials! Then I thought I would treat myself to some of your delicious crisp based potato snack items. And this is when things took a turn for the unpleasant. Now let me give you a little back ground on me, Cecil, I’m not a young man, I’ve been around a few blocks, I know how the world works more or less and I have come to term with the fact that some produce go out of production. It’s a sad fate to be sure, I still weep and pine for a Cadburys Spira! So several years ago when your company in their infinite stupidity decided to cease production of the salt and black pepper sensations crisps, I literally rued the day! It was a black day when I walked into my Tesco and saw the rest of the sensations range, but no longer my beloved salt and black pepper sensations. I wanted to write and complain there and then, but I was simply too upset. It was what started off a great depression of mine, and try as hard as my beloved wife did to recreate those crisps with your ready salted and her own black pepper, they simply weren’t the same. Years passed and I still couldn’t bring myself to write to you and voice my shock and disbelief at this baffling action. I assume they weren’t a good seller, but they always were the first to sell out in our Tesco. Because they were simply the best crisps ever made! And that’s taking into account Brannigans roast beef and mustard! So then imagine my horror when as I was walking in my Tesco this morning I spy a new flavour of sensations, at first my heart sang with the joy of a thousand cherubs in spring! Then as I adjusted my glasses and read the flavour on the packet my heart sank, like a Titanic in April. This new flavour still wasn’t a return of the Salt and black pepper deliciousness. It was some prawn based taste, I don’t know specifically because I’ve forgotten! Why are you constantly bringing out these dreadful new flavours and not reinstating a classic?! Nobody I know cares about onion based crisp flavours! And on closer inspection these crisps were from you ‘Extra crunchy’ line. I have no idea what the thinking was being this product line, who wants thick crisps!? I did a short survey and 3 out of three people said ‘no’ they didn’t want crunchy crisps! And if that’s the feeling across the nation, you’re backing a losing product line there! So I write this to literally beg you, Walkers crisp people, I beg you like Braibbian would beg his Alfontae in summer, please bring back the salt and black pepper sensations type, pleeeeseesseeessaseeeee!!!!!! If you do bring them back I will literally sing your praises. What’s the biggest crisp walkers have ever made? Do you get free crisps for working at walkers? Will you ever do those things were you hide money in bags again? Have you ever seen a crisp with either Jesus or Mother Mary in/on? What are your thoughts on the inferior crisps/corn snacks? Do you do Willy Wonka style tours of your factory and would it be possible to get in the crisps and swim around in them like Augustus Gloop did (obviously not while they are being cooked, that would be far-fetched and foolish)? My third point is that sometimes in crisps you get a lump of pure flavour coating, ie a chunk of the flavour powder that has congealed into a lump. This to me, is like finding a diamond in a coal face. I love it very much. I’ll sign off now, thank you for taking the time to read my letter, I hope you will personally reinstate the salt and pepper crisps, I assume you have that level of authority, and if you don’t then I hope in time as you work your way up the walkers cooperate ladder (is that made of crisps) maybe you can bring about the new winds of change and reinstate this forgotten legend! I may have too much free time on my hands! Thank you for your recent email regarding Walkers crisps and our company. I have noted from your email that you have raised a number of different enquiries and I hope to be able to address all of your questions in turn. I would like to start with our Walkers Sensations crisps, and sadly, I do have to disappoint you as we have no future plans to re-launch the Sea Salt & Cracked Black flavour crisps within this range at this time, though I shall certainly be passing on your feedback regarding this flavour to my colleagues within our marketing and developments team. It is always a difficult decision for our marketing teams when they have to discontinue a flavour, though you are correct in that this normally is the decision that is made when a particular flavour is not as popular and not selling as well as originally anticipated. With regard to our Extra Crunchy crisps, I am sorry to learn that this range is not to your taste. Whilst I appreciate that you have spoken with friends about these crisps I can also confirm they were launched some time ago and have proven to be very popular so far and we trust that they will continue to grow in popularity in the future. Your 2nd point raises the questions that you son has asked you to ask of us, along with mentioning that he also has a very popular You Tube channel and he would like us to send him some free samples so he may review these on his site. Sadly I do have to disappoint him as this is not a form of advertising that we can support at this time. *What’s the biggest crisp walkers have ever made? We don’t make crisps dependant on their size, and as I’m sure you’ll appreciate our crisps are limited to the size of the potatoes available. *Do you get free crisps for working at walkers? I haven’t met Gary Lineker so I would not be able to confirm or deny your son’s suspicions. *Will you ever do those things were you hide money in bags again? Our promotions team are always considering new and exciting promotions for our products, the best way to keep up to date is by registering on either our Facebook page or by registering your interest at our website. *Have you ever seen a crisp with either Jesus or Mother Mary in/on? *What are your thoughts on the inferior crisps/corn snacks? Working at Walkers crisps, I only enjoy Walkers crisps and Snacks so I am unable to comment. *Do you do Willy Wonka style tours of your factory and would it be possible to get in the crisps and swim around in them like Augustus Gloop did (obviously not while they are being cooked, that would be far-fetched and foolish)? Sadly we are unable to offer factory visits at this time. Your last point in your letter mentions that you have found lumps of flavouring within purchases of our products and whilst I understand that you have quite enjoyed the flavours, I would like to assure you that they should not be within any purchases from our range and we would ask that if you do find lumps of flavour to let us know so that we may address this with the relevant production team in the future. I do hope that I have managed to answer all of your concerns, but if either myself of any of my colleagues can help further please do not hesitate to contact us again, either by email or telephone on our freephone number 0800 274777. Thanks once again for your email. Firstly let me commend you for not only taking the time to read my electronic thought sheet, but also taking time from your life to reply to it in such a thorough manner. Though as you work in customer support, I suppose this is part and/or parcel of your jobs remit. I hope my words didn’t upset you as from your reply you’ve had to impart bad new to me on almost every possible point. I have to admit I was highly disappointed to read that there are no plans to bring back the salt and cracking black pepper crisps. If I was a younger man I may use one of these modern emoticons, but as it stands I’m old and loath the slack way the youths speak. What does chillax even mean!? Am I (he) allowed to review Walkers crisps on my (its) YouTube channel, if I (him) purchases them myself (his own) or is this illegal. I (Paul) ask this because you never seen on or in telly/magazines reviews of food products. They review gadgets or ‘tech’ as that bald person calls them, and cars get reviewed by rich idiots, but never food stuffs. Why can’t we be told which is the best instant coffee? Mellow birds or Nescafé? Which brand of Rice cakes is the least cardboard? Maybe the TV people have missed a trick, maybe it will be the new format on daytime TV, replacing the endless antiques based searching. I (he) might go on dragons den with the idea! Unless it’s illegal to review/compare foods/products? So to go back to my (her) initial question am I allowed to review Walkers crisps in a video on my YouTube channel, ranking the best flavour in a top 5 style list section, I would probably also discuss what crisps and size bag to choose for a film, or tv depending on crisp thickness, bag size, deliciousness and film/tv program being viewed. There is no point in having a single small bag if you’re watching something like an action blockbuster because the mind numbingess of said film would mean your attention wavers and you consume a higher number of crisps! Whereas some kind of psychological thriller is going to keep your mind going and you won’t be reaching for the snackables as often, so you could get away with just a couple of normal size bags. I have yet been unable to determine how many crisps are needed for one of these chickadee flicks as I’ve never watched one! Sorry I seem to have gone slightly off topic. So in summation, can I review Walkers crisps that I purchase myself, or will I have to refer to them as ‘the leading brand of crisps’ and would I be able to include packaging or would it have to be blurred out? Hello again, Cecil here, he’s got himself in a legal quagmire and is deeply confused as to why all TV shows don’t show products. And I have to admit I’m unsure, and I can’t afford a lawsuit. I can’t afford a normal suit either. I have also sadly never seen a Jesus or Mother Mary in a crisp, or any kind of snack produce, though I have on occasion put a blue towel on my head and pretended to be Mary, though my wife takes offense at this so I don’t do it anymore. I shall sign off now, again thank you Karen for your swift and thorough reply. I am sad there won’t be any more salty & cracked black pepper crisps. I’ll have to try and make my own, though if my wife’s attempts were anything to go by, it will result in over peppering of the throat and a coughing/sneezing fit. I’m really happy that I have been able to help with your enquiries even though I have had to disappoint you. Sadly, I have to disappoint you once more as whilst we are very happy to learn of both yours and your sons enjoyment of our products, we are unable to support any product endorsement which is outside of our own business, as we have our own teams who work very hard, dedicating their time into this very area. I have also following my email yesterday passed your comments onto my colleagues within our developments and marketing teams regarding how much you have missed our Sensations Sea Salt & Cracked Black flavour crisps and perhaps if they receive enough requests this may be something they will reconsider in bringing back to the market in the future. Wishing you the greatest enjoyment in creating your favourite flavour within your kitchen for the time being. Begone vile tasting non salt and pepper crisps! 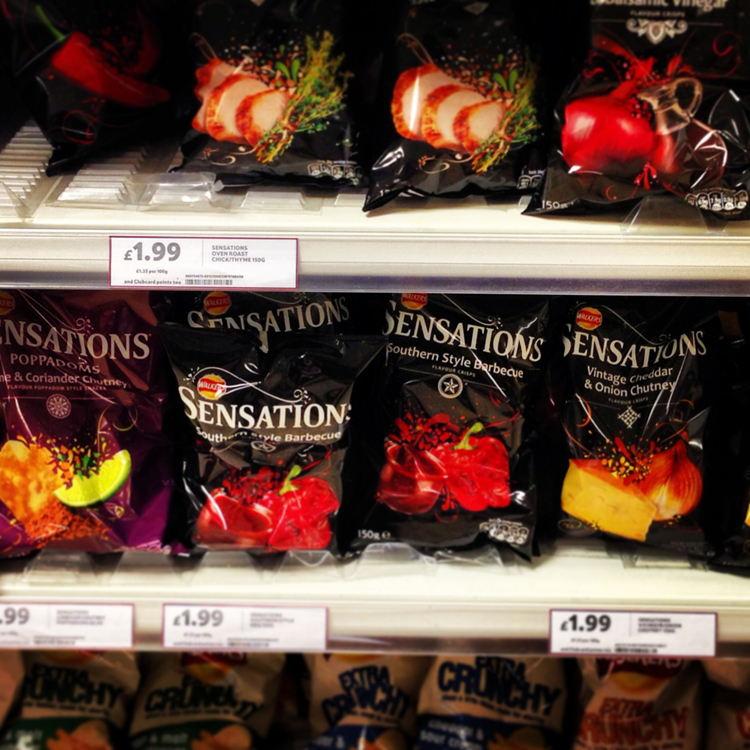 How do I ask for the Sensatonal Sea Salt and Black Pepper crisps to be made?